An interplay of past and present, large and small, predator and prey, Forgotten Songs engages audiences with the beauty, unexpectedness and unfamiliarity of these displaced birdsongs. 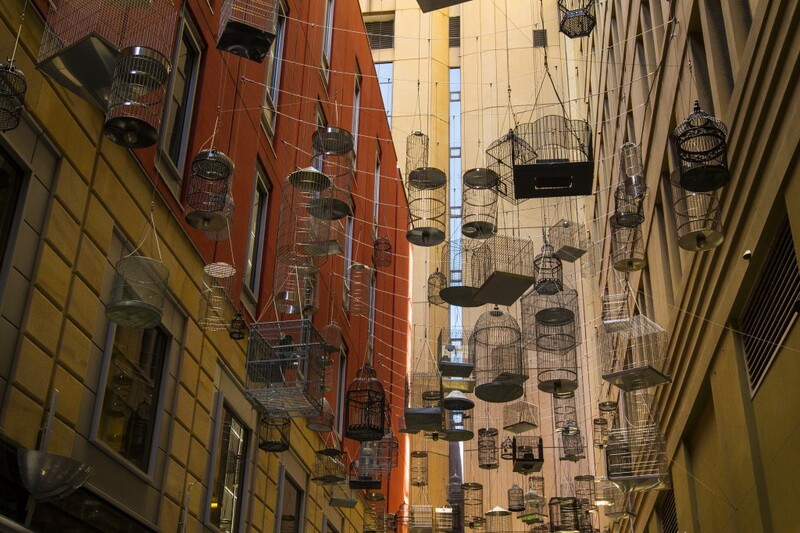 The installation explores how Sydney’s fauna has evolved and adapted to co-exist with increased urbanisation – inviting contemplation of the city’s past, its underlying landscape, and the sustainability issues associated with increased urban development. 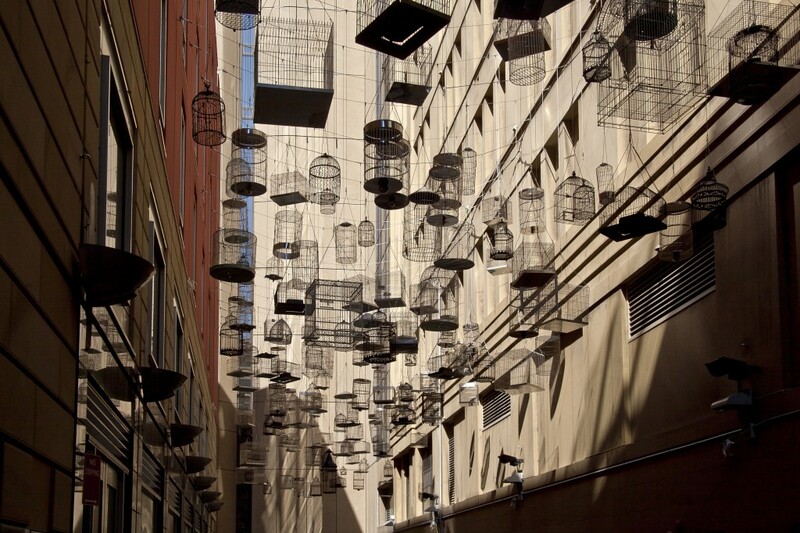 Forgotten Songs commemorates the songs of fifty birds once heard in central Sydney, before they were gradually forced out by European settlement. 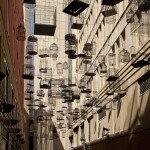 The calls, which filter down from the canopy of birdcages suspended above Angel Place, change as day shifts to night; the daytime birds’ songs disappearing with the sun, and those of the nocturnal birds, which inhabited the area, sounding into the evening. Habitat loss is credited as the biggest threat to bird survival. At present there are 129 species of birds native to New South Wales formally listed as extinct or threatened with extinction. 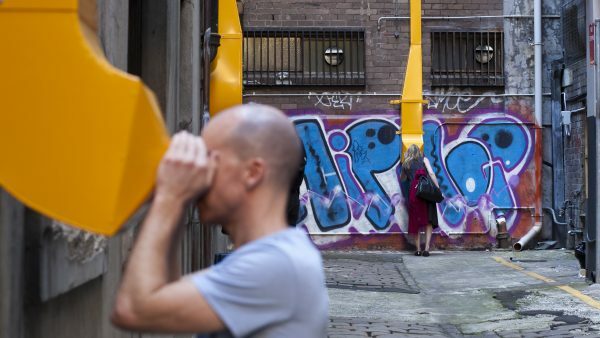 The recordings you can hear in Forgotten Songs are from bird species that sang in central Sydney. 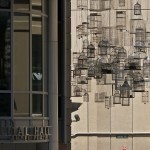 Some of these birds can still be heard on the city margins where they find food and nesting sites in thick native vegetation, while others have retracted still further. Bigger opportunists like the white ibis and sulphur crested cockatoos, as well as introduced species like pigeons and mynahs, all thrive in the city. These are the calls we often notice in the city today, if we can hear anything above the traffic. During the day in Forgotten Songs, you may hear the calls of the Eastern Whipbird, Rockwarbler, Regent Honeyeater, Grey Shrike-thrush, Fan-tailed Cuckoo, Spotted Pardalote, Brown Gerygone, Jacky Winter, Scarlet Robin, Golden Whistler, Leaden Flycatcher, Dollarbird, White-eared Honeyeater, Superb Lyrebird, Brown Thornbill, Varied Sittella, Brush Cuckoo, Dusky Woodswallow, Eastern Spinebill, White-throated Treecreeper, Little Lorikeet, Mistletoebird, Pallid Cuckoo, Red-browed Finch, Rufous Whistler, Brown-headed Honeyeater, Scarlet Honeyeater, Eastern Yellow Robin, Shining Bronze-Cuckoo, Southern Emu-wren, Spotted Quail-thrush, Striated Thornbill, Superb Fairy-wren, Tawny-crowned Honeyeater, Grey Fantail, Variegated Fairy-wren, Whistling Kite, White-browed Scrubwren, White-browed Woodswallow, White-naped Honeyeater, White- throated Gerygone, Wonga Pigeon, Yellow-faced Honeyeater and Yellow- tufted Honeyeater. Dr Richard Major developed a schedule of the bird species based on the type of soil (therefore the type of vegetation that grew there) and also on the fact that the Tank Stream runs through the area and may have encouraged other different species to live close by. 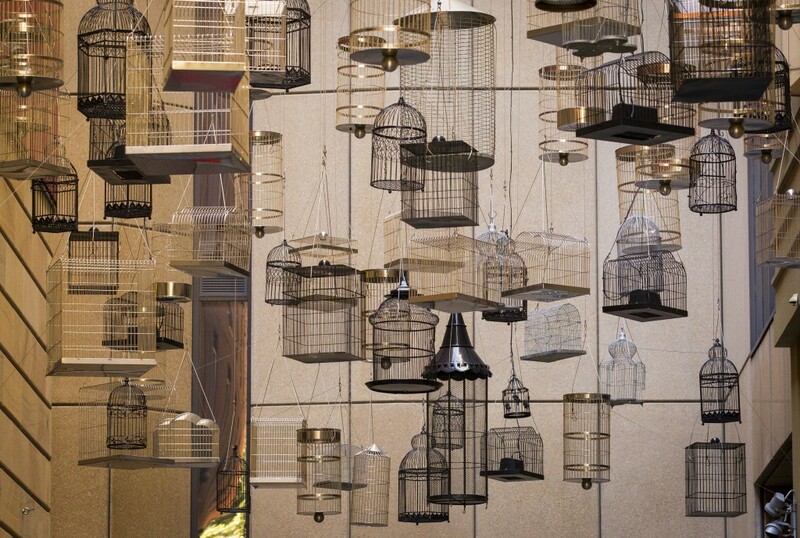 By examining the Australian Museum collection of bird skins gathered from various parts of the city from about 1850 onwards, and using reasonable estimates based on similar vegetation types elsewhere in the Sydney area, Major created a list of 50 species of both diurnal and nocturnal birds. Wildlife recordist Fred van Gessel, had recorded the birdsongs of all these species and provided the sound files for this project. 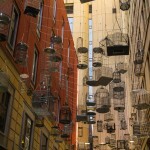 Some of the songs can be heard on the Australian Museum/Birds Australia website, Birds in Backyards. 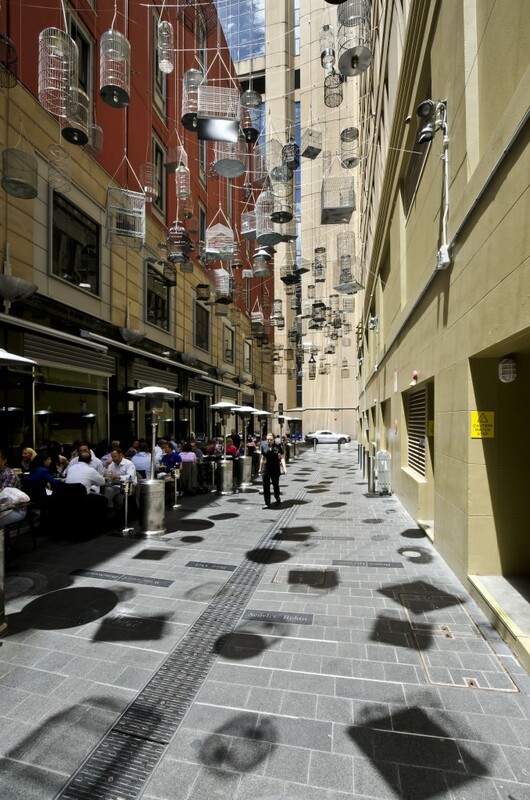 Forgotten Songs was first shown as part of the Laneways Temporary Art Program 2 on view from 10 October 2009 – 28 January 2010. 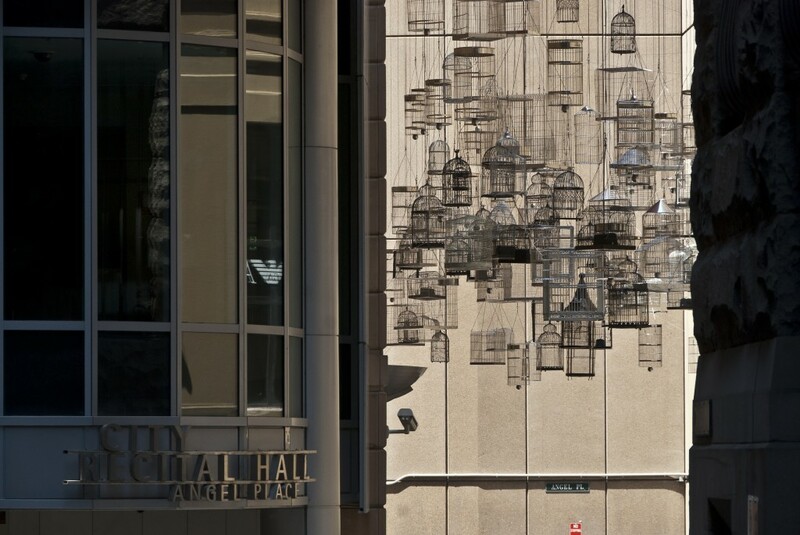 It was possible to recommission this popular work as part of the upgrade of Angel Place in 2012. 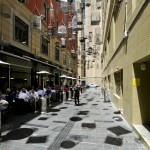 The second Laneways program was titled By George! Hidden Networks and sought collaborations across at least three disciplines to address climate change and urban renewal in the city’s lanes. 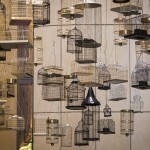 It was curated by Dr Steffen Lehmann and consisted of eight artworks.